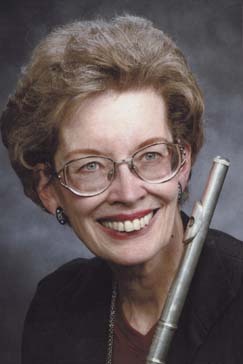 Susan Goodfellow is a professor of flute at the University of Utah. She holds degrees from Julliard School of Music and the university of Chicago, and studied with Julius Baker and William Kincaid. She has soloed with the Carmel (California) Bach Festival and the Mormon Tabernacle Choir and performed with the New York City Symphony and the Chicago Chamber Orchestra. She worked as a music editor for Encyclopedia Britannica and was assistant editor of The Britannica Book of Music. She has given lectures, recitals, and master classes across the United States, and served for two years as secretary of program annotator for the Salt Lake Chamber Music Society and on the editorial board of The Flutist Quarterly.